Range Oven Bake Element. The manufacture has made a design change to this part and the new heating element has a different style mounting bracket that uses one mounting screw instead of two. This is a new GENUINE Whirlpool replacement part. 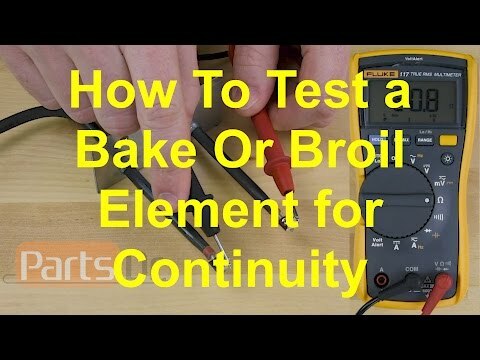 Learn how to test your bake or broil heating element for continuity using a multimeter. Took the lower pan out of the oven, and took the back panel off to expose the connections to the element. Unhooked the element. Took the 3 screws out that hold the element in the bottom of the oven, replaced with the new element. Made the connections in the back and replaced all parts. Total time: about 8 minutes. I actually have a Maytag oven, but it crosses with the whirlpool parts. The element wasn't EXACTLY the same, but there was no issue at all installing it. Shut power off at breaker panel. Check oven to make sure power is off. Remove all racks, remove bottom tray, remove cover plate from back oven wall, disconnect (2) two terminals from old bake element, remove bake element. Reverse procedure for installation of new element. Oven wasn't getting up to the proper temperature. Drill/Screwdriver/Mult-meter to verify the old element was bad. I followed the youtube video on how to replace the baking element in my oven. A lot easier than I thought it would be. This part PD00008690 (Mfg #W10779716) works with all models listed.